Mayor Watson has officially launch a special contest that engages children and youth aged 16 and under to celebrate the future of transit in Ottawa. It’s the Name the Trains Contest. 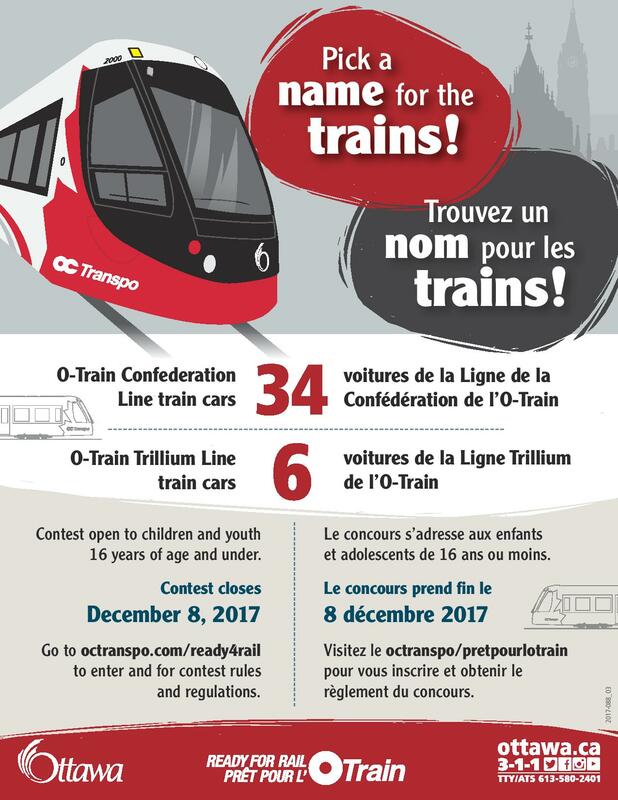 This contest provides the next generation of transit users with a unique opportunity to see their suggested names continue down the rail lines – the O-Train Confederation Line and O-Train Trillium Line – for many years to come. This is a great opportunity to get your children, nieces, nephews or grandchildren involved in playing a part in naming the train cars that will be a part of the biggest infrastructure project in Ottawa’s history, since the days of Colonel By and the building of the Rideau Canal. 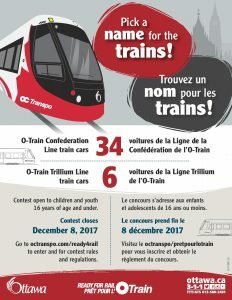 The entry form, along with more contest details – including rules, regulations and guidelines – are available at octranspo.com/ready4rail. Each participant can submit as many name suggestions as they wish, but he or she can only win once. However, before submitting, they must first get permission from a parent or guardian. Please visit octranspo.com/ready4rail for more information.